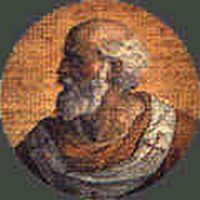 Boniface V (died October 25, 625) was pope from 619 until his death. He did much to Christianize England, and the Venerable Bede writes of this pope's affectionate concern for the English church. He was also responsible for enacting the decree of "sanctuary," by which churches became places of refuge for those pursued by the law. He is buried in St. Peter's. He seems to have been a good and modest man about whom no one uttered ill.
Boniface's relatively short reign took place in nonetheless interesting times. The horrible Gothic wars had ended and the succeeding Italian kingdom of the Lombards had begun. An exception to Lombard hegemony in Italy was the piece of Byzantine Greece known as the exarchate of Ravenna, one portion of which was the Duchy of Rome, ruled politically by a Byzantine imperial representative but best represented in things cultural and religious by the head of the church of Rome, the pope. The late 500s and early 600s were thus a time when a certain resistance to both Lombard and residual Greek rule started to take hold in and around Rome-a sense of separate "Italian" identity, invested in the church of Rome and its leader. This started, of course, a few popes before Boniface, in the person of Gregory the Great. And of marginal historical interest is the fact that Boniface, himself, was pope when another religious leader in a distant land was about to make his mark: our year 622, the middle of Boniface's reign, marks the hegira, the emigration of Muhammad and his followers to the city of Medina. It is the year 1 in the Islamic calendar. Between 1309 and 1377, the Papacy resided in Avignon, France. The reason for the move to Avignon is complicated. Briefly, it involved conflict between the French crown and the Papacy. The French side of the conflict centered on the person of Philip IV of France (1268-1314), intent on expanding the central authority of the monarchy and exerting infuence over the French clergy. He was so successful that a conclave elected a new pope, Clement V, a Frenchman, in 1305. Clement refused to move to Rome and, instead, in 1309 moved the papal court to Avignon, where it remained for the next 67 years. During that period of the Avignon Papacy, there were seven popes, all born in France. Catholic historians refer to this period as the "Babylonian captivity of the Church" (an allusion to the Biblical exile of the Jews in ancient Babylon from 597-538 B.C.) The period directly after the return of the papacy to Rome in 1378 and lasting until the Council of Constance in 1417 is the period known as the Western Schism. It was a time during which there were various rival claimants to the title of "Pope," including some referred to as "anti-Popes," a curious term about which there is inevitable confusion even among those who managed to stay awake during Medieval European History. The first pope of the Catholic church after the return to Rome was the Neapolitan Bartolomeo Prignano; he was born in Naples in 1318 and died in Rome in October of 1389. He studied canon law at the university of Naples and eventually became rector of that university before embarking on the ecclesiastical path that led to his election to the papacy. 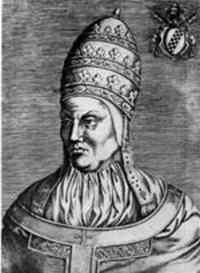 He took the name Urban VI and was pope from 1378 until his death. His election was a compromise since the Roman populace was on the verge of committing mayhem against cardinals over the possibility that after years of "captivity," there might be yet another French pope (which would satisfy those who had not liked the idea of the return to Rome.) The Romans wanted a Roman, but finally accepted any Italian, who happened to be Prignano. His election was not only hard-fought and disputed, but his opponents held another election shortly thereafter and selected a second pope, Robert of Geneva, known as Clement VII, who would still reign from Avignon. This division of Rome from Avignon produced the "schism"- most of western Europe accepted Clement, but parts of Germany and Italy recognized Urban. Urban's papacy was, by most accounts, not a success, but trying to head a divided church is a task that has an obvious built-in risk of failure and one that is bound to invite criticism from commentators in later years. His own queen of Naples, Joanna, went over to the supporters of Clement. Urban conspired to have her replaced by Charles of Durazzo and went south to check out the old neighborhood; he was promptly arrested and imprisoned in Aversa. He was sprung and fled. The rest of his reign was a series of misadventures and included being excommunicated by Clement, the Avignon pope; Urban also proclaimed a crusade against Clement that did not pan out. Urban was inconstant and quarrelsome and died probably as the result of a fall from a mule, though some sources claim that he was poisoned. 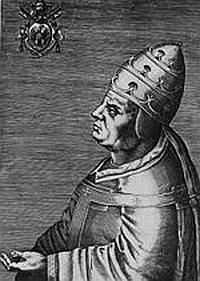 Urban was succeeded by another Neapolitan, Pietro Tonacelli, who took the papal name of Boniface IX (1356-1404). He was Pope from 1389 to 1404, during part of which time Clement VII was still the Avignon pope (called an "anti-Pope" by modern Catholic historians). He had the allegiance, more or less, of those who had supported his predecessor, Urban. (Boniface and Clement also mutually excommunicated one another.) Boniface IX was known as an adept businessman and raiser of funds through such things as the sale of dispensations. He used the money to-among other things-shore up and strengthen the Papal States, which had been greatly weakened during the time in which the papacy had resided in Avignon. He also tried-and failed-to call out a Crusade against the Ottoman Empire, the forces of which were threatening Constantinople. Both he and his anti-Pope counterpart in Avignon, Benedict XIII (successor to Clement VII) showed no signs of compromise in resolving the confusion of competing papacies (which would have meant, obviously, that one of them would have had to abdicate). After Boniface, there would be two more Roman popes during the Western Schism: Innocent VII and Gregory XII; Benedict XIII was the last Avignon pope during the Schism. (There were other rival claimants, as well.) Resolution occurred at the Council of Constance (1414-1418), which put an end to the Western Schism by deposing all papal claimants and electing Pope Martin V.
If you have not read the item above this one, it would help to do so. Concerning this month's announcement by Pope Benedict XVI that he is stepping down as the head of the Roman Catholic church, many sources remind us that we have to go back to the year 1415 to find a similar case-the resignation of Gregory XII. That is true, but the back-story is more interesting than that simple statement of fact. The council of Constance was convened in 1414 to resolve the problem of the Western Schism. As noted in the main text (above), that schism came about as a result of the Papacy having resided in Avignon for 70 years. Even after the return to Rome from its "Babylonian captivity"* (note below) in 1376, there continued to be rival claimants to the Papacy, some recognized by Avignon, some by Rome and some by neither. At the time of the council of Constance, there were three such candidates: Roman Pope Gregory XII, Avignon Antipope Benedict XIII, and Pisan Antipope John XXIII. (Note that the term "antipope" is an ad hoc term used by subsequent Catholic historians to indicate illegitimacy; the followers of John XXIII, for example, referred to him as "the pope," not the "anti-pope." He is, in fact, the one who originally convened the Council of Constance.) The council was convened to choose a replacement for all three, one acceptable to all. Thus, while it is true to say that Gregory XII resigned, so did the other two. It is not clear exactly to what extent voluntary resignation was in play. The council had set itself up, very unusually, as being above the Pope for the purposes of selecting a new one; that is, the decision of the council would be final. They selected Martin V (1368-1431; secular name Oddo Colonna). That ended the Western Schism. The three rival popes did resign, true, but they were actually deposed. There were a few other papal resignations before that, the most famous of which (because it is mentioned in Dante's Divine Comedy) was that of Celestine V, elected pope in 1294 and who resigned a few months later in Naples. The music conservatory in Naples is named for him. The Papacy returned to Rome in 1376. Petrarch died in 1374, so he missed witnessing the fulfillment of one of his life-long dreams. Also, the phrase "Babylonian captivity" in this context should not be confused with another usage, that of Martin Luther, whose Prelude on the Babylonian Captivity of the Church was published in October 1520. Luther meant here that the church, the entire family of Christians, was being held captive by the popes of Rome, which he referred to as "Babylon." Indeed, he called the pope the "anti-Christ." Petrarch's letter criticizing the Avignon Papacy: [This is taken from Fordham University's website, specifically Medieval Sourcebook, which cites as its source, J. H. Robinson, Readings in European History (Boston: 1904), p. 502. ...Now I am living in France, in the Babylon of the West. The sun in its travels sees nothing more hideous than this place on the shores of the wild Rhone, which suggests the hellish streams of Cocytus and Acheron. Here reign the successors of the poor fishermen of Galilee; they have strangely forgotten their origin. I am astounded, as I recall their predecessors, to see these men loaded with gold and clad in purple, boasting of the spoils of princes and nations; to see luxurious palaces and heights crowned with fortifications, instead of a boat turned downward for shelter. We no longer find the simple nets which were once used to gain a frugal sustenance from the lake of Galilee, and with which, having labored all night an caught nothing, they took, at daybreak, a multitude of fishes, in the name of Jesus. One is stupefied nowadays to hear the lying tongues, and to see worthless parchments turned by a leaden seal into nets which are used, in Christ's name, but by the arts of Belial, to catch hordes of unwary Christians. These fish, too, are dressed and laid on the burning coals of anxiety before they fill the insatiable maw of their captors. Instead of holy solitude we find a criminal host and crowds of the most infamous satellites; instead of soberness, licentious banquets; instead of pious pilgrimages, preternatural and foul sloth; instead of the bare feet of the apostles, the snowy coursers of brigands fly past us, the horses decked in gold and fed on gold, soon to be shod with gold, if the Lord does not check this slavish luxury. In short, we seem to be among the kings of the Persians or Parthians, before whom we must fall down and worship, and who cannot be approached except presents be offered. O ye unkempt and emaciated old men, is it for this you labored? Is it for this that you have sown the field of the Lord and watered it with your holy blood? But let us leave the subject. I have been so depressed and overcome that the heaviness of my soul has passed into bodily affliction, so that I am really ill and can only give voice to sighs and groans.